Home » Competition » Nigeria » 4 Million Naira For Grabs in Nigeria Agriculture Awards(NAA) Youth Project and Essay Competition 2018. 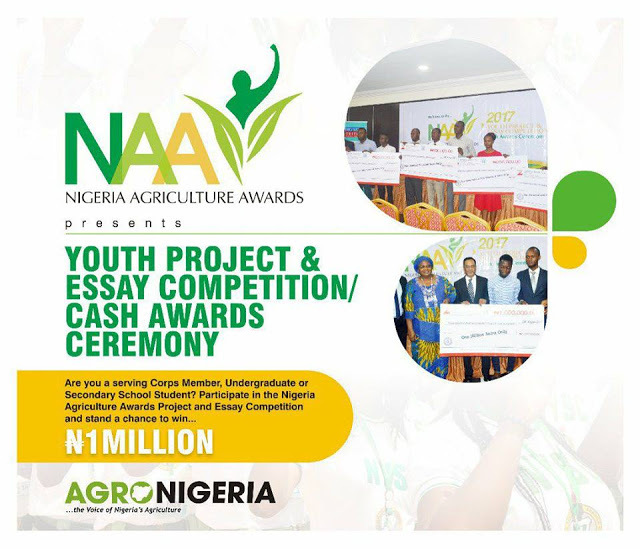 4 Million Naira For Grabs in Nigeria Agriculture Awards(NAA) Youth Project and Essay Competition 2018. Shortlisted Candidates will participate in a social media contest spanning two weeks. Shortlisted corps members will be contacted for an interview to defend their projects. Project: Conceptualise a project that solves a key problem in the agricultural sector, draw up a timeline for its completion and the likely impact it will have if implemented. Shortlisted teams will be contacted for an interview to defend their projects.